Do you suffer from nomophobia? A lot of us do. Nomophobia is the irrational fear of being without your mobile phone or not being able to use it because of the (admittedly terrifying!) prospect of not getting a signal or the battery running down. One of the more startling mobile usage statistics is that the average user taps, clicks, or swipes their phone 2,617 times per day. Crazy, isn't it? Even without the formalized phobia or the eyebrow-raising statistics, you already knew that we're addicted to our phones. That's one of the reasons marketers are flocking to mobile Short Message Service (SMS) marketing. It makes sense to put your message in the place where your prospects and customers are placing their constant attention. An internal study recently showed that 98% of text messages sent from our platform are read. Other research found that 90% of text messages are read within the first three minutes of receipt. Those are engagement numbers you won't find challenged by any other marketing channel. So, if you're looking to make an almost guaranteed connection with your prospects and customers, mobile SMS marketing is the way to do it. In this post, we'll show you how to maximize the reach and impact of this highly valuable marketing opportunity. Not only is mobile SMS marketing effective, it's super simple. This isn't like planning the manned trip to Mars. But just because it's fast and easy to do, doesn't mean you know the best practices intuitively. We've helped over 50,000 customers succeed with mass text messaging, so we've seen what works and what doesn't. Here are five mobile SMS marketing strategies which beginners often overlook. One of the most common SMS text messaging mistakes newbies make is not dedicating enough resources to growing their list of subscribers. With engagement rates over 90%, your text list should be the number 1 priority for getting opt-ins. NOTE: Text message marketing is a permission-based activity. Just because you have someone's cell number doesn't mean you can send them marketing texts. You have to get their permission first. "Text 'SUBMARINE' to 474747 to get a free pizza the next time you purchase a 16-inch pizza." In that example, 'SUBMARINE' is the Keyword and 474747 is the Short Code. The Short Code will be supplied by your bulk SMS marketing platform, and you'll reserve your own Keyword(s) when you sign up. It's a best practice to use a single-word Keyword if possible. Try not to use a Keyword which auto-correct will "correct" when the contact sends the message. Once you get a Keyword and decide on an incentive to join, advertise that offer everywhere. Put it on signs in your store or office, send it to your email subscribers, use it in radio ads, print it on your receipts, etc. You can also use a signup widget, which most text marketing platforms provide. These customizable widgets are easily embedded on your website or social media pages. 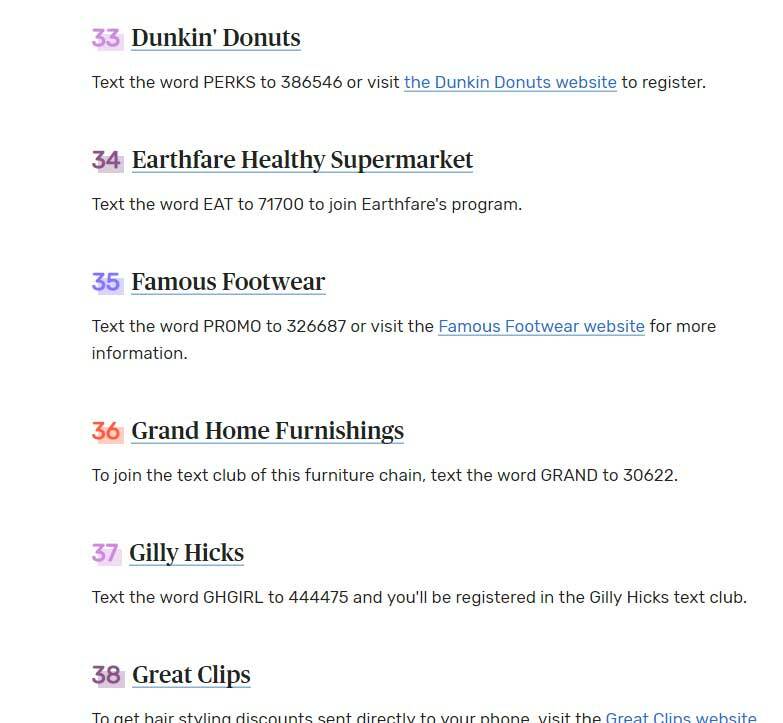 For inspiration, check out this list of 100 big brands using both Keywords and website sign-up forms to grow their lists. Once you get subscribers, keep them engaged with exclusive offers and promotions. Because engagement rates are so high, prioritize mobile SMS marketing above other channels to connect with contacts. Make sure your contacts know that they will get deals through text which are offered nowhere else. This will keep them subscribed and interested in your messages. Some marketers even refer to their text subscribers as VIPs, so that they feel like part of a special group. Check out how one restaurant owner uses his text VIP list to boost sales in this case study. 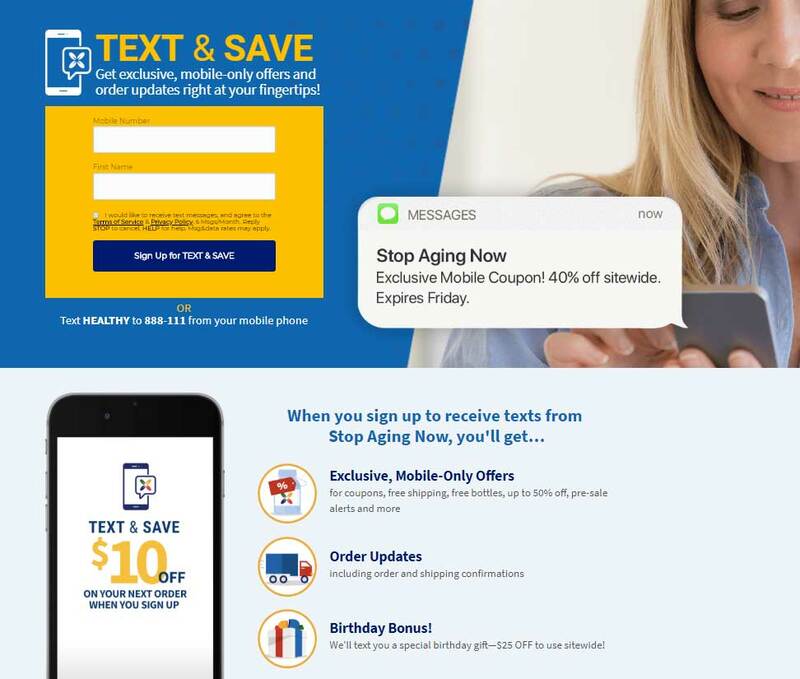 Health products company Stop Aging Now offers several exclusive, mobile-only offers through their attractive website landing page. How often will you be texting your contacts? The cadence of text sends may depend on the type of organization you run. A nonprofit might only send texts once a quarter, while a real estate agent might send daily texts to hot prospects who are in "buy" mode. The important thing is to pick a rate that your contacts would likely appreciate and stick to it. If you start off monthly and suddenly switch to daily texts, you'll lose subscribers. You might even want to test letting prospective subscribers know how often they'll receive texts to allay the fears they may have of getting overwhelmed by your marketing messages. When you promote your list, consider including a note like: "Promotions are sent once a week." 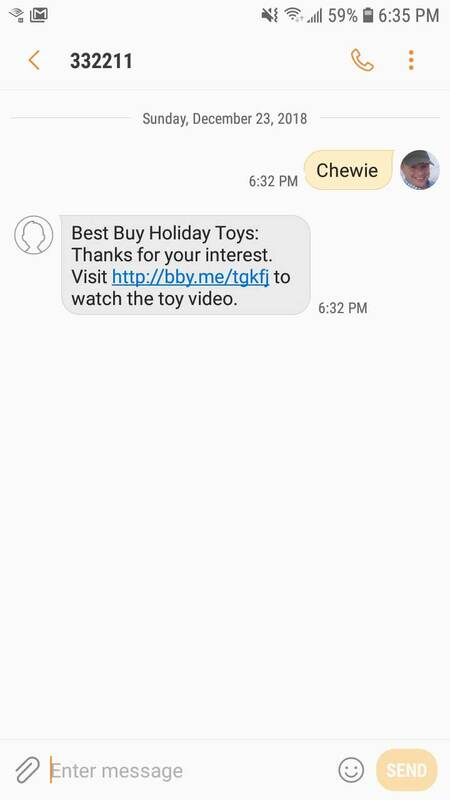 Retailer Bath & Body Works recently promoted their exclusive text program on Facebook, specifying that recipients would get no more than six messages per month. Don't send SMS messages just to send SMS messages. Make sure the text provides value to the recipient. Almost all text marketing messages should include a Call-to-Action (CTA). Tell your contacts what to do and how to do it. These CTAs could be "Reply to enter," "Call 123.456.7891," "Show this text to your waiter," or "Visit [Shortened Link]." It's important to use a link shortener when sending web hyperlinks in text messages. Your mobile SMS marketing platform should provide a link shortener which enables you to save characters in the text and track clicks to measure engagement. Best Buy offers easy access to product information by using simple Keywords in combination with their 332211 Short Code. The instant auto-reply for the "Ultimate Co-pilot Chewie" toy delivers a "Visit: ..." shortened link CTA which takes the prospective buyer to a 360-degree video of the toy and easy ordering. While there are some best practices which work for almost any type of business, you'll want to look at your analytics to see how your particular market responds to the campaigns you send. Your text marketing platform should provide easy-to-read reports and analytics tools which allow you to see the big trends and drill down to determine how specific groups of contacts or individuals engage with your texts. Keep an eye out for responses by time of day, contact demographics, purchase history, etc. Then optimize future campaigns based on these observations. These five mobile SMS marketing strategies will help you get off to a fast start. Follow these guidelines and you'll dodge the potholes which slow down a lot of first-time text marketers. We've been the leader in the mobile marketing software space for over a decade. During that time, we've helped a lot of companies achieve their goals with SMS marketing. We've collected some of the most valuable tips in a new eBook which will take you deeper than the five strategies in this post. In The 9-Step Roadmap to Mastering Text Message Marketing, you'll get more specifics to get off on the right foot. Get it now.